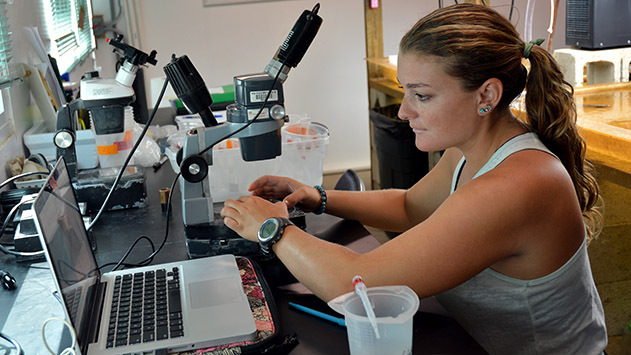 Danielle Becker, who is currently spending her third summer at BIOS, works in the Reef Ecology and Evolution Laboratory taking pictures of coral larvae to measure their size as part of ongoing investigations into coral's resilience to environmental change. Growing up in the northwest suburbs of Chicago, Danielle Becker’s parents encouraged her and her sister to explore and appreciate the natural world. For many years, her family traveled to visit relatives in Florida over spring break and Becker recalls feeling amazed by the ocean. When she was 6 years old, her family visited the Discovery Cove marine park in Orlando, where she snorkeled in the Grand Reef exhibit—a large artificial reef that allows visitors to swim among more than 125 species of marine life, including sharks, rays, and tropical fish. Having a first-hand look at the interactions among marine life left her wanting to learn all she could about coral reef environments. Two years ago, this sense of wonder and excitement about the marine world brought Becker to BIOS as a summer research intern. Since then, she has become a familiar face at the Institute, continuing the research she started when she first arrived, advancing her skill sets, and gaining both teaching and mentorship experience. Given her early love of the ocean, it came as no surprise that Becker chose to attend Florida’s Eckerd College and pursue a bachelor’s degree in marine science. Eckerd College, located in St. Petersburg, is not only close to the marine environment that interests Becker, but also has a reputation for involving undergraduate students in hands-on research opportunities throughout their degree programs. Case in point: Becker’s first research experience occurred freshman year during her biological oceanography course. For one of the class labs, students traveled by boat into the waters of Tampa Bay in Florida and were asked to compare the diversity of plant and animal species between sand and sea grass habitats. As Becker’s first learning experience in a research-based course, it was particularly eye opening. Becker dives on Hog Reef, a rim reef in Bermuda, collecting corals for a histology study that is investigating the reproductive structures in coral tissues. Results of this study will help scientists understand the timing of coral reproduction which, in turn, will allow for more successful field collection for future coral reproduction research. In 2016, during her senior year at Eckerd, Becker applied for and received the Galbraith-Wardman Fellowship. Established in 1994 by John and Rosemary Galbraith, then renamed in 2014 to recognize the support of George Wardman (an Eckerd College donor who, for many years, sat on the BIOS Board of Trustees), the fellowship supports one student from Eckerd each year as a research intern at BIOS. For Becker, who wanted more research experience but was unsure of the next step, this seemed like a great opportunity to travel, learn field research and experimental methods, and decide if research-based science might be a possible career path. 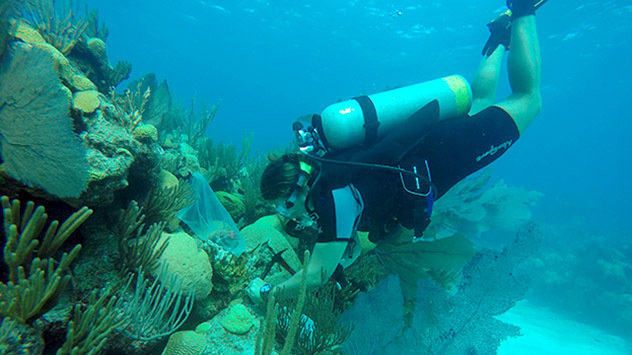 After graduating from Eckerd in May 2016, Becker traveled to Bermuda to begin her internship at BIOS with Gretchen Goodbody-Gringley, a reef ecologist studying how reef ecosystems function in order to maintain biodiversity. Becker’s research project focused on investigating the reproductive ecology—or how reproductive success is influenced by environmental variables—of a local coral species in both shallow and mesophotic reef environments, from depths of 100 feet to over 490 feet (30 to 149 meters). This multi-year research project would later form the foundation for Becker’s second publication in a peer-reviewed scientific journal. The final paper, “Reproductive ecology and early life history traits of the brooding coral, Porites astreoides, from shallow to mesophotic zones,” was published in the June 2018 issue of the journal Coral Reefs, with Becker listed as a co-author. When the internship ended later that summer, Becker kept in touch with Goodbody-Gringley and expressed an interest in assisting with the second year of the coral research project. In August 2017, Becker received BIOS Grant-in-Aid funding to return to Bermuda and continue working with Goodbody-Gringley on coral reproduction research. At the same time, she also worked as a teaching assistant for the 2017 summer coral reef ecology and marine biology and oceanographic research courses at BIOS. She followed this by a month working alongside BIOS microbial oceanographer Rachel Parsons in the Microbial Ecology Laboratory to gain additional experience and learn new lab techniques, such as how to prepare slides and work with the PCR—a technique used to make multiple copies of a segment of DNA. In October 2017, while assisting Goodbody-Gringley on a newly funded coral research project, she had the opportunity to meet Nyssa Silbiger, a biology professor at California State University Northridge and one of the project collaborators. While working alongside Silbiger in the lab, Becker spoke with her about grad school, her research interests, and career goals. Soon after, Becker applied to graduate school at California State University Northridge. In March of this year, Becker received her acceptance letter and this August will begin her graduate studies, working in Silbiger’s lab conducting research on coral ecophysiology, the study of how the environment interacts with corals’ physiological processes. However, before she begins this next stage in her academic career, Becker is spending another summer at BIOS. In May she returned to work again in Parson’s lab as a research assistant, and then was hired to work with Kevin Wong—a doctoral student at the University of Rhode Island (URI)—on his thesis research. Under the mentorship of Goodbody-Gringley, Samantha de Putron (a marine biologist and ecologist at BIOS), and Hollie Putnam (an assistant professor at URI), Wong is conducting investigations that aim to address the question of whether corals can acclimatize to temperature stress and, if so, whether there are consequences for their health and reproductive fitness. Becker is also mentoring Amy Amatya, a Princeton-BIOS intern, who is working with Goodbody-Gringley and de Putron on similar research into how coral acclimatizes to temperature disturbances in the environment. And, beginning July 22, she will be reprising her role as a teaching assistant for the summer coral reef ecology course. In doing so, she hopes to show undergraduate students that successful careers in research are attainable, as her mentors have done for her.